This church is often overlooked amidst all of the focus on the sanctuaries. Bernadette Soubirous, the young girl who had the visions of the Virgin Mary at the Massabielle Grotto that led to Lourdes's fame, came from a poor family. The "new" parish church, Sacred Heart, was built in the late 1800s and has been in use since 1903. Its current fame comes from the fact that the baptismal font used for Bernadette was moved from the old St Peter's church to this one. A large wall panel depicts Bernadette's baptism. 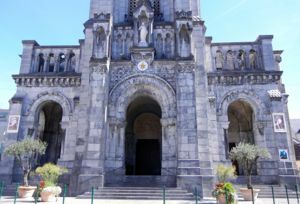 We probably would not have seen the church, had we not parked nearby, a wise choice rather than trying to drive closer to the sanctuaries through the narrow, crowded streets of Lourdes. Above, Facade of the Parish Church of the Sacred Heart, Lourdes, France.